Look what arrived in my mailbox yesterday! While I was away last week I spent some time surfing the net, looking for gorgeous cross-stitch designers - Stacy Nash was one of the first I found and now her patterns have arrived. You should have seen me opening the box - oh so carefully - not!!! I couldn't wait to get it open to see the goodies - this picture does not do them justice - they are divine. I don't know about you but I love patterns and books that are beautifully presented - these little books have an opaque type of cover that is fastened with a ribbon. Probably sounds silly, but somehow it just seems that little bit more special undoing the ribbon and opening the pages - makes you think ''what secret treasures await''. And treasures there are! I haven't done any cross stitch for such a long time, but over the past few months I've been seeing some incredibly beautiful work on the web and other blogs and it has sparked the old desire to cross stitch again. I even got out the linen a couple of weeks back and played around with an idea that's been floating around ''upstairs'' for a little while. I'll give you a peek soon (if it works!). Off now to maybe finish block four of Vero's mystery quilt - it's very cute. Gorgeous patterns. 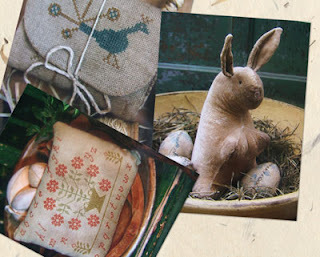 Love the rabbit..so old & worn too.